When we talk about the environmental sustainability of Pikaia Lodge, we can’t limit it to the environmental sustainability of our buildings and its operation. We have to question the very existence of Pikaia Lodge. One school of thought is that tourism, and the development of more tourist infrastructure will harm the unique wildlife of the Galapagos, and this is a valid concern and one that we share. 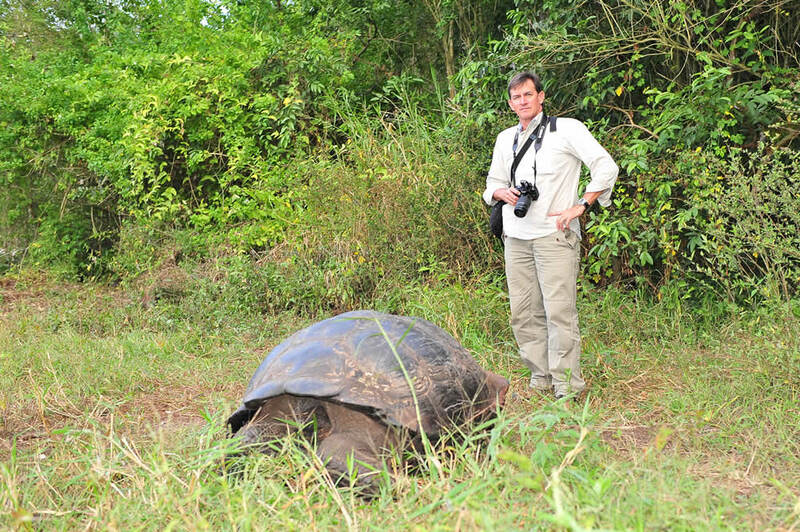 However, many people involved in the work to achieve equilibrium between development and preservation, including the Galapagos National Park Service and the Ecuadorian environmental authorities, believe that eco-tourism is an important part of the solution to preserving the Galapagos Islands. The key is tight regulation and effective management. The Galapagos tourism model is not, and will never be, similar to the hedonistic, resource-intensive model of south-east Asia or the Caribbean. Neither is it Ibiza, nor Hawaii, with mass tourism and massive hotel infrastructures, casinos, golf, discos, crowded beaches and condos. 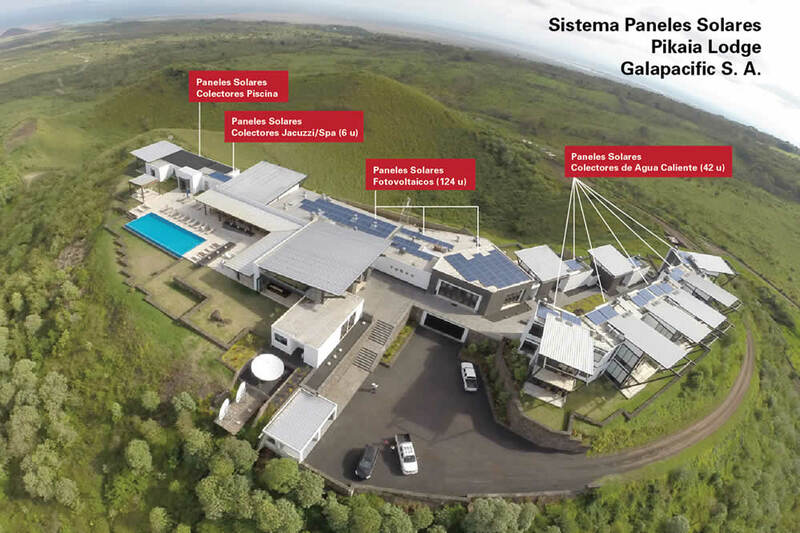 The Galapagos model is designed exclusively for a controlled number of very selective eco-tourists, who will eschew over-development; this is why people travel to the Galapagos in the first place. Ecuador understands that the islands are fragile and must be protected. 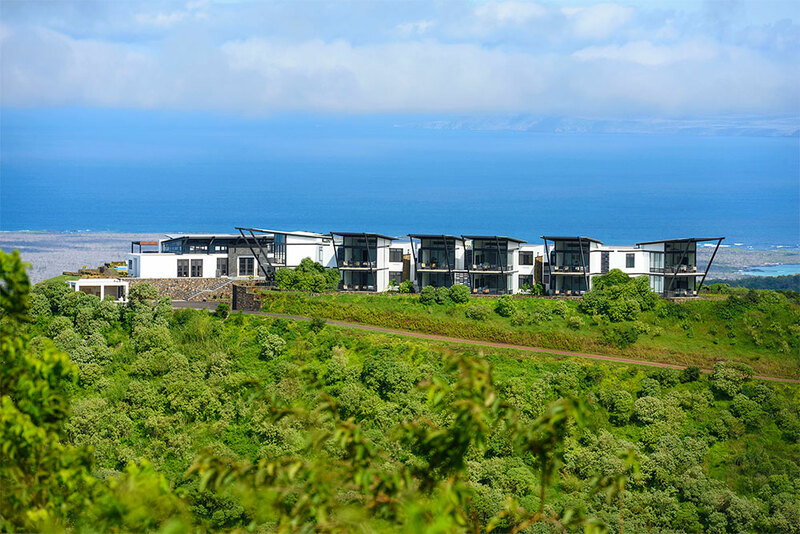 A strict Galapagos law, internationally recognised as a landmark legislation, has been put in place specifically to prevent such overdevelopment. 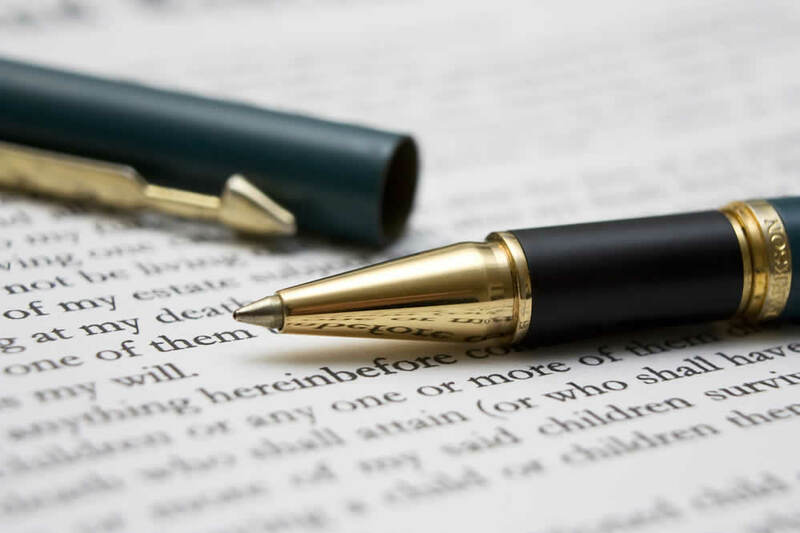 This law limits even the constitutional right for Ecuadorians to settle in the islands, to prevent overpopulation and reduce demand on resources. But the Galapagos Islands do face complex local, social and economic challenges, which we are working to identify and address. 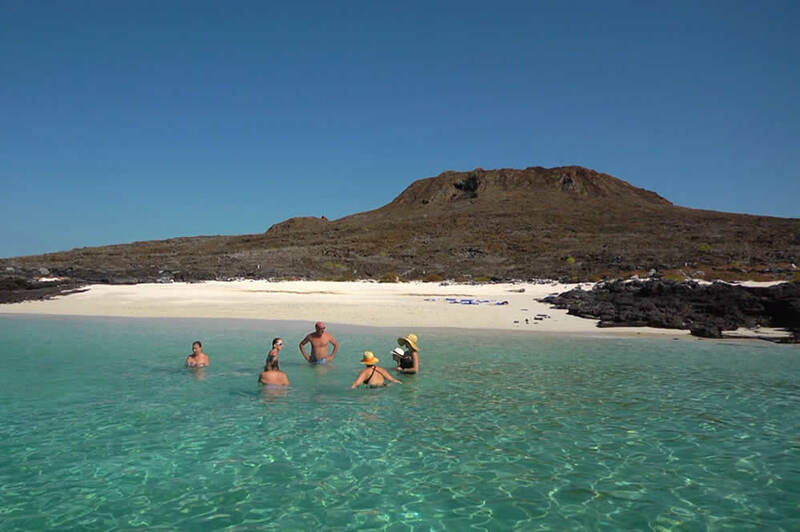 The Galapagos Islands are one of the most ecologically diverse hotspots on the planet. A focus on environmental sustainability is fundamental, especially during the development of a new land-based tourism model (hotel stay/day tours) rather than the traditional live-aboard yacht/cruise ship model. To manage tourist numbers, the authorities do not issue new permits for live-aboard yacht or cruise ships, nor for increasing passenger capacity, and have not done so for nearly 20 years. But each year more people want to visit the Galapagos. Ecuador understands that eco-tourism is a valid, sustainable way to create income in its efforts to overcome unemployment, without damaging the environment. 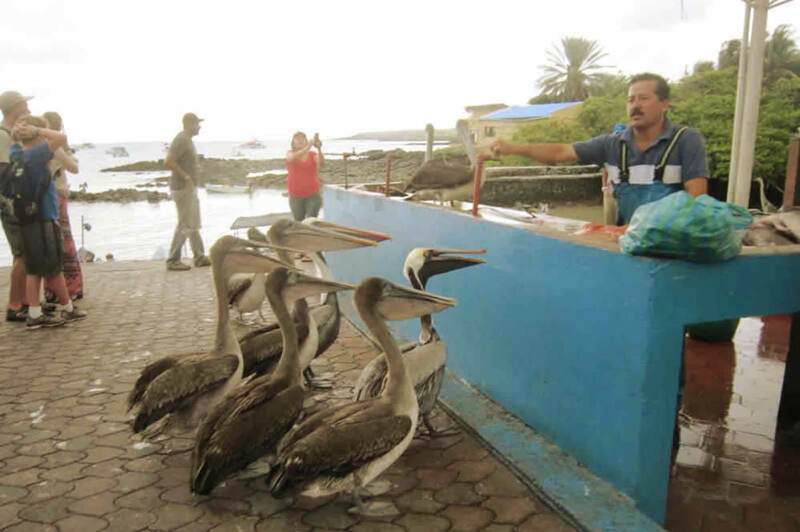 The Galapagos Islands are the country’s number one tourist attraction; many visitors to The Galapagos also travel to the country’s other national parks and generate a sustainable income for them as well. 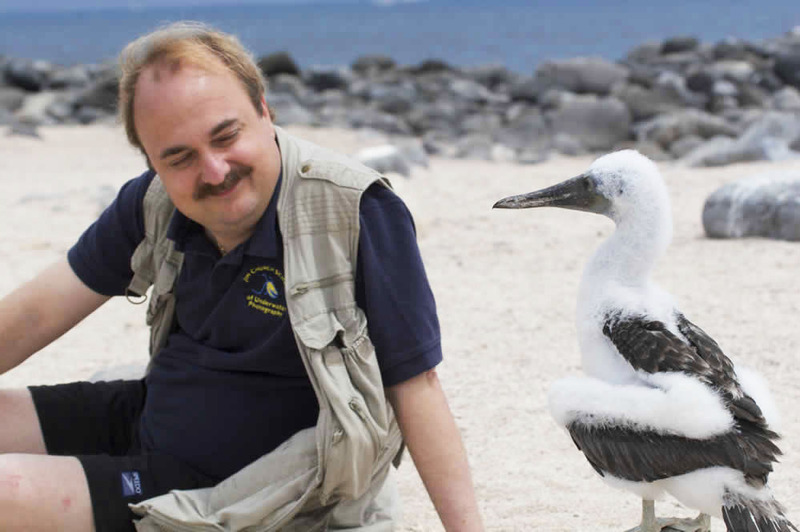 The Galapagos National Park Service is financed entirely from park fees. Only 0.5% of the total National Park area is visited by tourists, and these few sites are still extremely well-preserved and well-managed. It is because eco-tourism was developed here 40 years ago, well-managed by authorities and supported by the private tourism sector, that wildlife still thrives here, both on the land and in the sea. The "ecological capital" of the islands is best protected from permanent destruction by harnessing it for eco-tourism, even with the potential challenges this entails. The shift from a live-aboard cruise to a land-based tourism model, also creates non-extractive, sustainable jobs and investment opportunities for some of the 30,000 existing residents on the islands. The land-based model stimulates and supports local business and services. It aims to distribute the economical benefits of eco-tourism among the local population. There are many examples of the social and environmental benefits of this model. In the past, some local fishermen would illegally catch sharks for their fins. 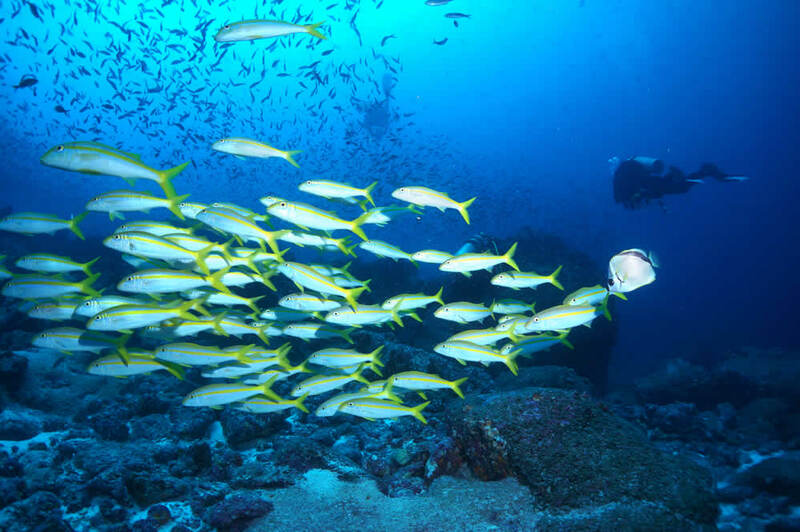 They are now given the opportunity to switch their fishing permits for new day-tour diving permits, protecting sharks and other marine life, and taking divers and snorkelers to them. 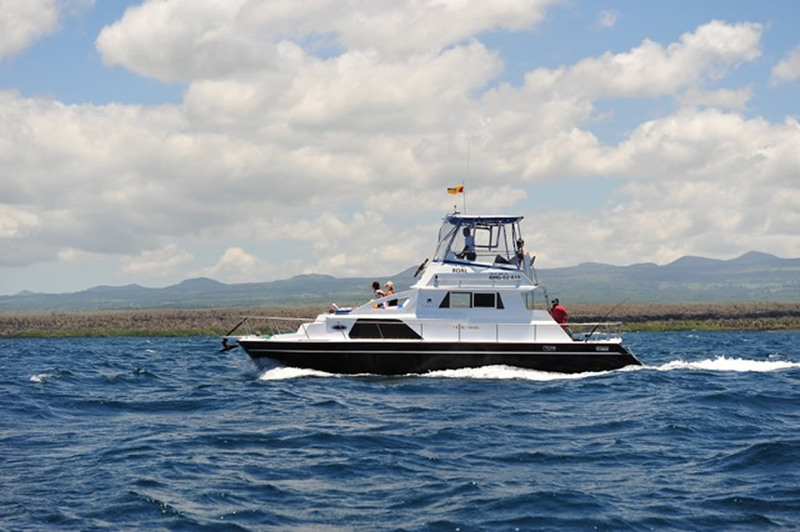 Or for those with new vivential fishing day-tour permits, their new income from recreational sport fishing and snorkeling tours contrasts with their previous Galapagos income earned from fishing. Even farmers that would banish giant tortoises and endemic birdlife that damage their crops, or unwittingly introduce invasive commercial species and harmful chemicals for pest control, have found new income alternatives by developing small eco-tourism services and supporting wildlife on their lands. This model suggests the possibility of a virtuous circle; as wildlife is perceived not as a pest or export commodity, but a source of income through eco-tourism and conservation. At Pikaia Lodge we believe that, well-regulated and managed, our land-based tourism is a positive model for the long-term preservation of the islands, combined with social stability and economical wellbeing for the settler communities. Pikaia Lodge has created more than 60 new jobs for Santa Cruz Island residents and contributes substantial resources to the island’s economy. Since inception, the owners of Pikaia Lodge have been committed to setting a new definition for a luxury eco-lodge. We define luxury not by opulence, but by the levels of comfort and service. 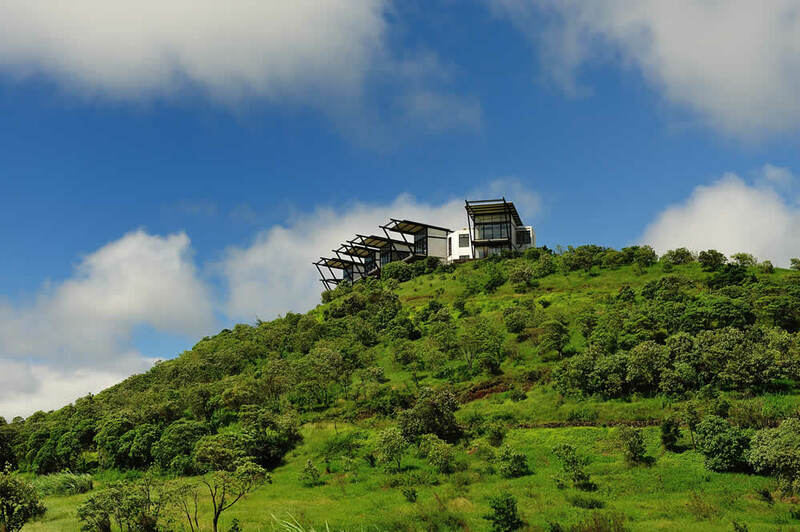 Pikaia Lodge has been designed and equipped according to the highest environmental specifications. We have enlisted world class experts to help us meet the challenge of offering guest five–star luxury with all their energy, resources and water needs met for optimum comfort, while achieving operational carbon neutral status. With just 29 rooms, Pikaia Lodge is an exclusive boutique experience. The first phase of operations offers 14 rooms with the main lodge building, and the future expansion has been planned to have no impact on guests or operations. As there is no native or ancestral architecture to model from, our designers opted for a contemporary luxury eco-lodge that would blend harmoniously with our unique crater topography. Under the direction of the Ecuadorian Architect Humberto "Coro" Plaza, one of Ecuador's leading architects, together with his team of architect: Roxana Castillo and interior designer Maria Elena Frei-Shephard, they came to the right solutions with creativity, well-applied eco-efficiency and sophisticated class, while offering a comfortable and cozy ambiance with "The evolution of the species", and the geological ages as a subtle, artistic décor. The lodge was built using the lowest possible quantity of concrete in order to minimize the use of locally mined aggregates and construction waste materials, by using imported pre-fabricated steel columns and beams. 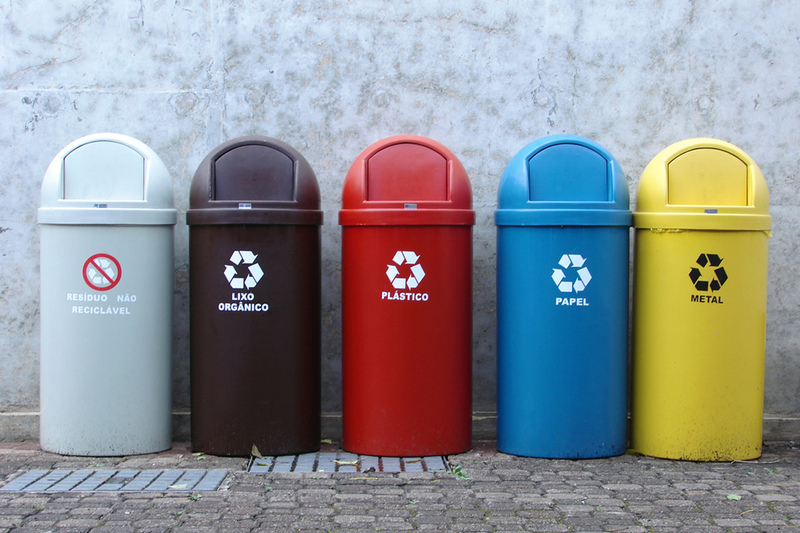 Steel is a highly recyclable material and cleaner in the whole construction process; Concrete is not recyclable. 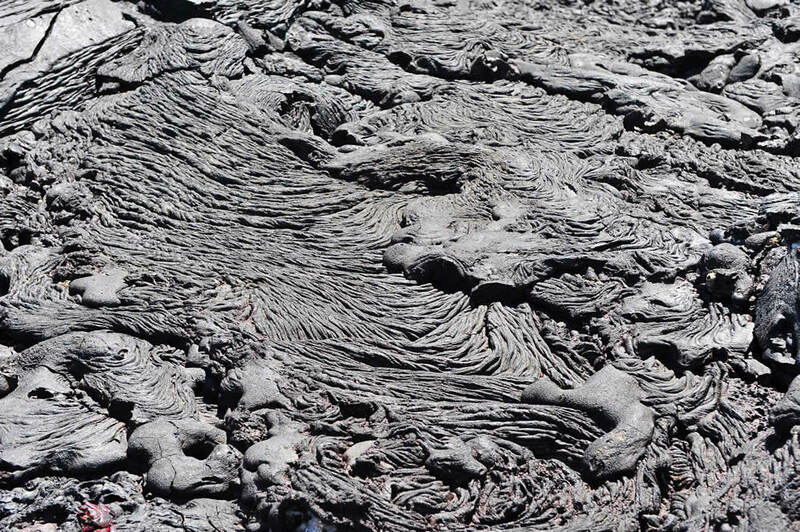 Natural Galapagos lava stone and tiles, cut locally by collecting stones by hand on selected sites with the approval of the National Park Service, are used on most floors and walls. Tiles are cleaned with high water pressure alone, without using chemicals or paints. Bathrooms tiles, countertops, some wall coverings and the pool decks are made of Peruvian Travertine and polished fossil marbles, to remind our guests of the geological ages of our past. Only sustainable, agro-cultivated teak and bamboo wood from the Ecuadorian mainland (and not from tropical rainforest), were used for most furniture, doors and décor to prevent deforestation and illegal logging. 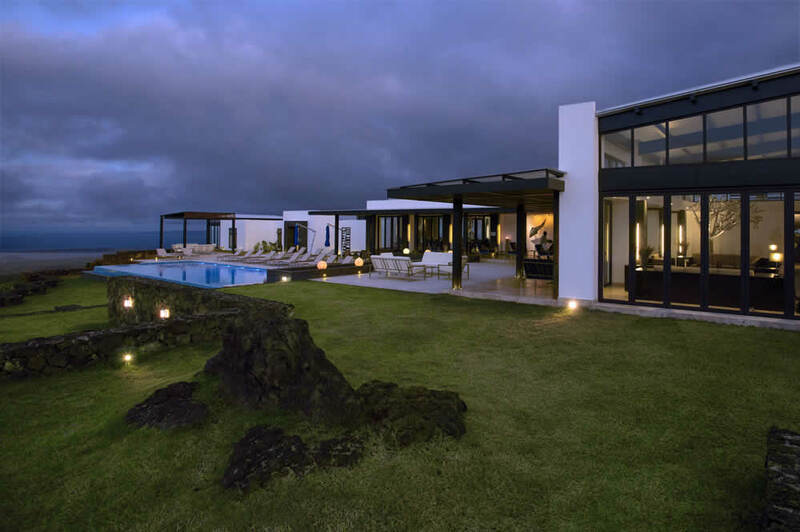 In a process that took almost five years, Pikaia Lodge received all legal permits required by the Ecuadorian and Galapagos Special Law. We carried out an in-depth environmental impact study and associated management plan, which were presented to the local community and the islands' highest authorities. The adjacent El Cascajo community supported the project with enthusiasm for the job opportunities that would arise. 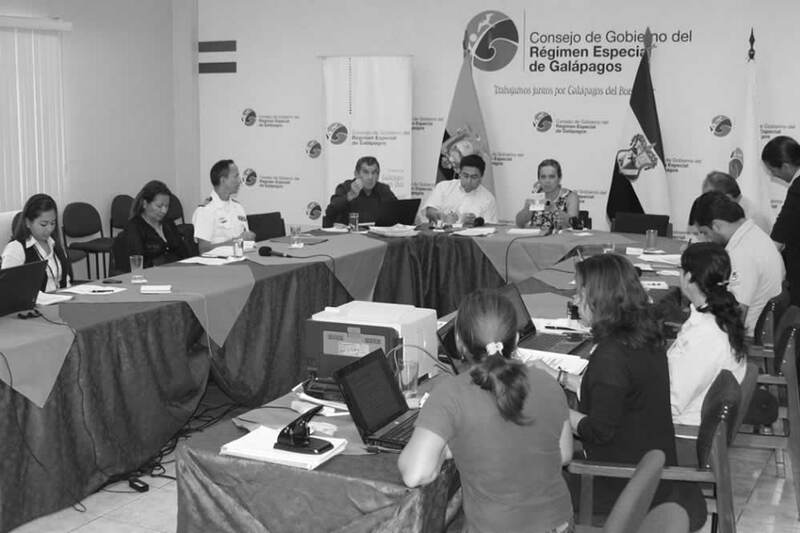 The study was approved by the Ministry of the Environment of Ecuador, and, following the approval of the Ingala Counsel, the highest administrative and political authority of the islands, we received our environmental license. 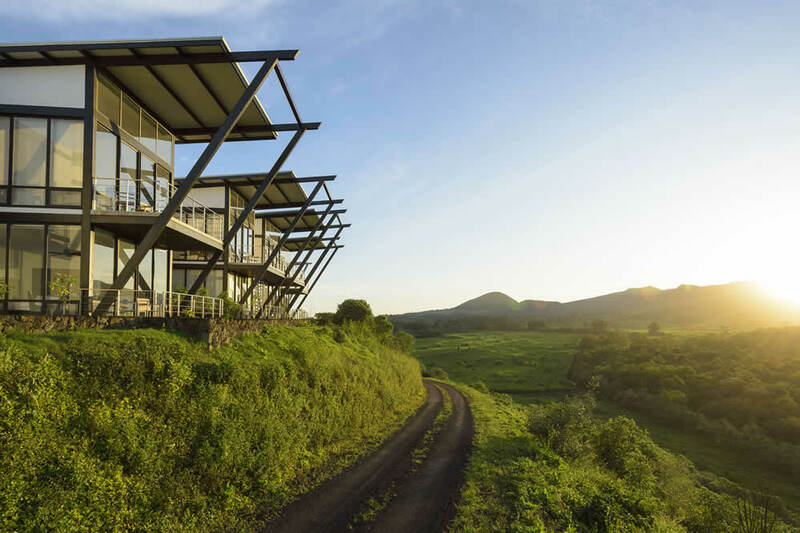 Pikaia Lodge is the first Galapagos entity to carry out this process in full, and any new hotel projects will be required to undergo the same rigorous process. The lodge was designed to use the sun efficiently, for natural interior illumination, an optimal placing of solar water heating collector panels and for solar photovoltaic energy production. 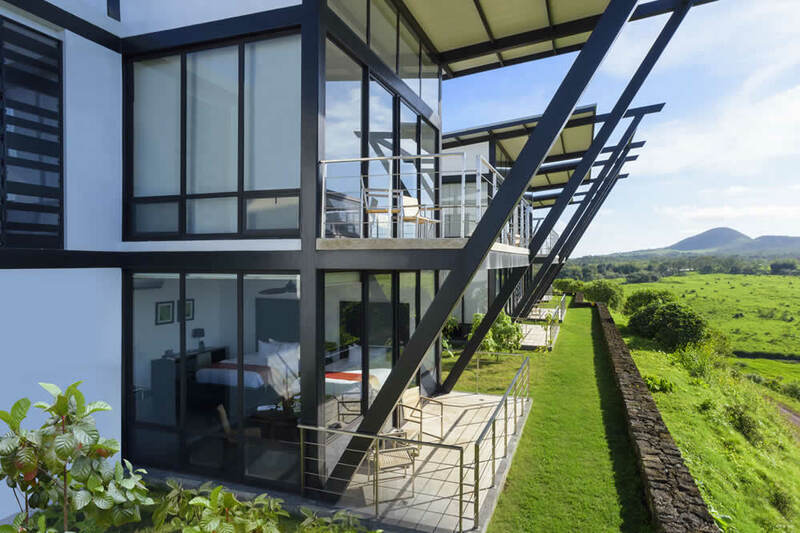 The lodge is oriented east-west and all social areas and guest rooms face either north or south to prevent the intense Equatorial sun coming in through our large panoramic windows. Passive cooling with cross air ventilation in all rooms and buildings by optimizing convection and natural air flows with a clever windows design. Natural and artificial shades for eliminating heat buildup. Light colored roofs for reflecting solar rays and prevent the heat island effect. Complete roof and wall thermal insulation. Laminated UV reflecting window glass with curtains and blackout for energy conservation in the air conditioned guest rooms. Guest rooms and offices have ceiling ventilators and split air conditioners with energy saving "inverter technology" for additional cooling, if needed. The Lodge is carbon neutral, and powered with a mix of conventional and alternative energy sources that do not pollute or emit greenhouse gases. 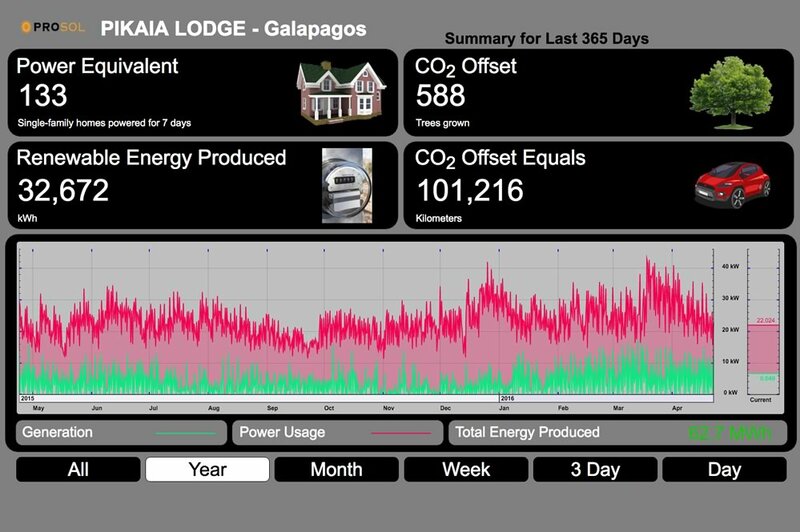 Recent technologies allow the Lodge to use photovoltaic solar power, and "grid tied", which means that the Lodge is connected and feeding electricity to the islands' electrecity grid. The Lodge aims to produce gradually enough electricity during the day as a surplus to compensate the amount that it uses from the grid. All Lodge emissions of CO2 will be vastly compensated and offset by the Lodge's endemic trees reforestation program. Interior and exterior illumination uses state-of-the-art ultra-efficient LED's and energy-saving fluorescent bulbs. Exterior lighting is low, in order to not attract insects, birds or bats and therefore prevent changing their natural feeding habits. There are solar luminescent materials for exterior signaling, and water is heated by advanced, highly efficient solar collectors. Kitchen, laundry and spa equipment uses clean LPG gas. Pikaia Lodge water comes from Pto. Ayora’s municipal wells, transported to the lodge by reliable third-party transportation to fill our water reservoirs. Using existing local businesses for this negates bringing more vehicles to the island, and fulfils our social responsibility pledge to use existing local businesses wherever possible. This well-water is treated with UV and ozone, but should not be considered potable. Our roofs are designed to collect rainwater to be purified by reverse osmosis, UV or ozone treated in a stainless steel reservoir, then used in the Lodge kitchen. This pure water passes again through other filters for cooking, making juices, drinking water and ice, avoiding the need for plastic bottles. We use high-quality water saving devices including toilets, water-saving shower heads and taps. The Lodge uses biodegradable cleaning products, detergents, soaps, etc. 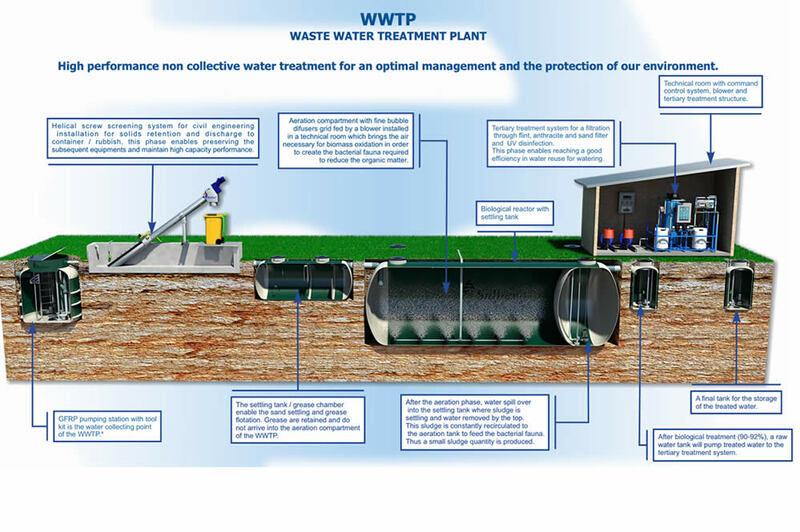 The Lodge has a modern, three-stage aerobic waste water treatment plant, using UV treatment to avoid any polluted discharge. 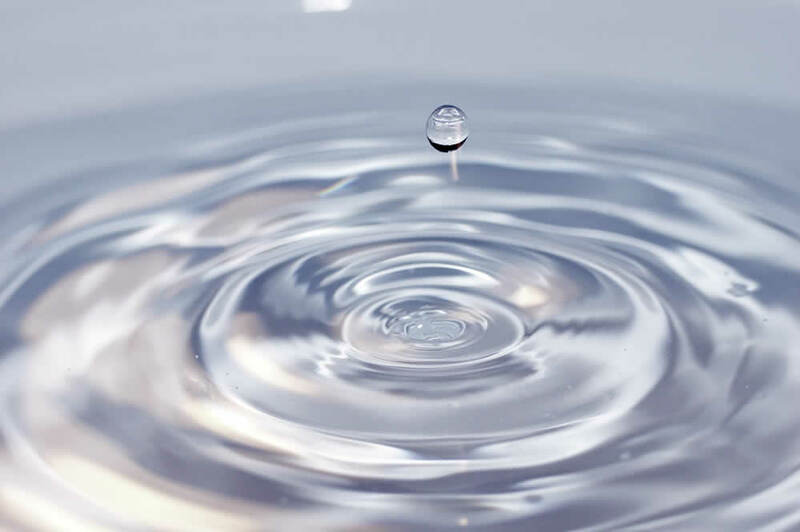 Most of the cleaned treated water is carbon-filtered; and is recycled for toilets, decks, floors and vehicle cleaning. Landscaping is with native endemic trees and vegetation, naturally adapted to our terrain and dry climate, avoiding the need for watering. The Lodge has separate waste containers for organics, papers and cardboards, plastics, glass and metals according to Pto. Ayora's municipal regulations. Organic waste composted for our greenhouse or collected daily by local farmers for pig food. 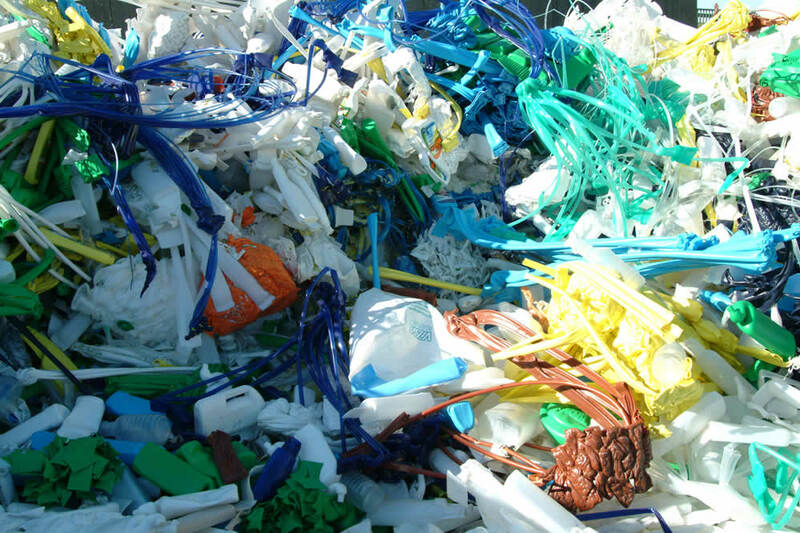 Plastics, glass, paper and cardboards are recycled in the Fabricio Valverde recycling center and shipped back to the continent. 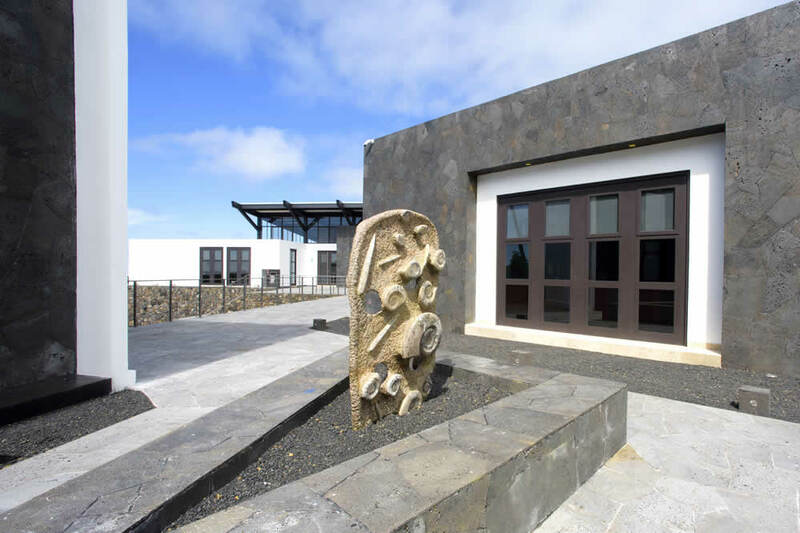 This center was created and is still financed by the private tourism sector of Galapagos through a conservation trust. 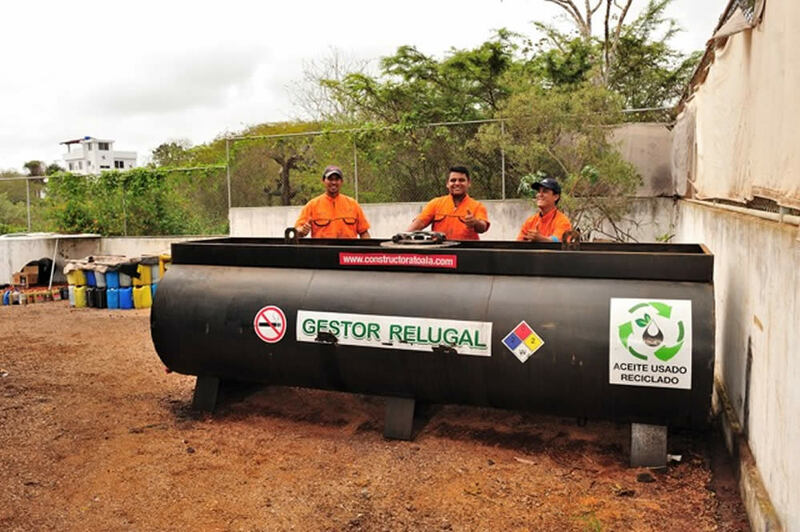 Used lubricant oils from our generators, vehicles and yachts are collected by Relugal, the island’s used oils recycling center. The oil is shipped back to the mainland for appropriate disposal. Privately operated and owned by an ex-fisherman, this recycling center was created more than 12 years ago, when used oils were otherwise dumped either on land or at sea, and is still principally financed by the owners of Pikaia Lodge. The project has been so successful, that to date more than 600,000 gallons of used lubricants has been shipped back to the continent. Our property was a private cattle ranch before we acquired it in 2006. We have to mention here, that 97% of the whole Galapagos land mass is national park area and is protected from development. Only 3% is private land for the use of farms and towns. In this former cattle ranch, all native vegetation and trees where cut down and replaced entirely by pasture by the original owners. We undertook six years ago the enormous task of restoring our property to its original natural state. 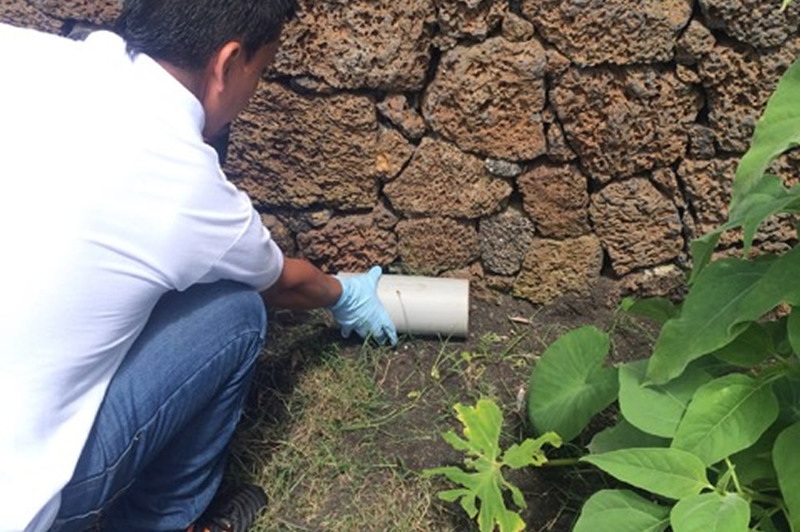 We have engaged in an ambitious program for reforesting with native and endemic species, in order to set favorable conditions for the wild tortoises and birds to return. 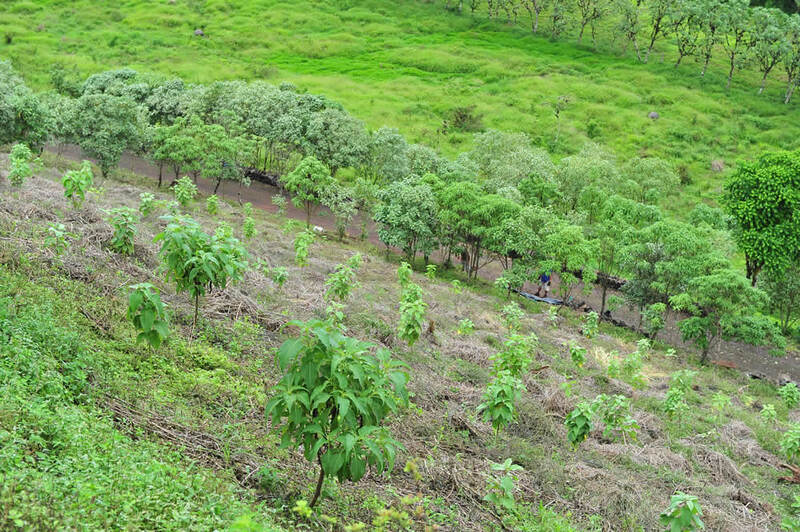 Not a single native or endemic tree has been cut down in the construction phase, and so far we have eliminated great extensions of pasture and introduced species; we have already replanted successfully more than 10,000 endemic trees. The wild tortoise have already returned in large and increasing numbers; birds are also now nesting and feeding on the seeds of the new trees again. This reforestation program will vastly offset any carbon emissions we might have.